Ray, Aaron E - Bates & Coleman (Lawyers) is practicing law in Houston, Texas. This lawyer is listed on Lawyer Map under the main category All Law Firms in Lawyers. 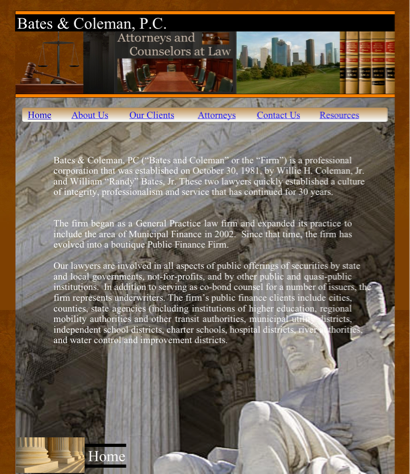 Ray, Aaron E - Bates & Coleman is listed under Lawyers in Houston, Texas . There's currently no information available about fees or if Ray, Aaron E - Bates & Coleman offers free initial consultation. The information below about Ray, Aaron E - Bates & Coleman is optional and only visible if provided by the owner. Call (713) 759-1500 to learn more. ..sentenced to community service...successfully completed community service. Need to find out how to get this 30+ year old non-felony (at the time)conviction exponged. My understanding was that successful completion of community service for this misdomeaner would prevent this 30+ year old misdomeaner conviction from following me for life...please call. (404)725-8717. Left message with receptionist. Contact Ray, Aaron E - Bates & Coleman to find out about hours of operation / office hours / business hours. Listed business hours are general only. Call (713) 759-1500 to learn about office hours.